Inflammation? Doesn’t sound good, does it? Turns out it’s both good and bad. On one hand, good (acute) inflammation is an element of the body’s healing response to infection, toxins and tissue damage. Cut a finger, sprain something or contract a respiratory infection, and the immune system reacts defensively. The resulting pain, swelling, redness, heat, fever or tingling are to help in the healing process. By killing germs and establishing a line of defense, acute in­flammation helps to prevent a problem from worsening. On the other hand, bad (chronic) inflammation is a potential horror story. This type can trigger a long list of disorders, including arthritis, asthma, blood flow issues, cancer and diabetes. In fact, it is believed to be at the core of disease. As the word “chronic” implies, this type of inflammation is persistent, so your body is on guard constantly. This is a problem. For example, if inflammatory cells are present for too long in blood vessels, the result can be an increase in plaque buildup. This can lead to thickening of the arteries, which increases the likelihood for a stroke or heart attack. A hallmark of the AIM mes­­sage is nutrition. Eating plant-based food is associated with les­sening the ravages of bad inflammation and supporting good inflammation. AIM provides concentrated forms of plant nutrients. While not promising to diagnose, mitigate, treat or prevent disease, there’s a wide variety of whole-food concen­trates and natural health prod­­ucts fea­tured in the 2019 Living Well catalog that may alleviate the bad kind of inflammation. inflammatory, antioxidant-rich whole foods and supplements are in­vestments in yourself that can pay a lifetime of dividends for your immune system. The AIM Companies has been dedicated to improving the quality of people’s lives with life-changing products like BarleyLife and CoCoa LeafGreens and by rewarding passionate Members with a free-enterprise compensation plan. Author The AIM CompaniesPosted on May 9, 2017 May 9, 2017 Categories Arthritis, BarleyLife, Frame Essentials, Glucosamine, HealthTags Health, LifestyleLeave a comment on What’s at the Source of Your Pain? People suffering with arthritis have a great need to cool the inflammation associated with pain and stiffness. Arthritis is just one of many diseases with the suffix -itis, which indicates an inflammatory condition. The AIM solution is ‘Nutrition that works’ at the source of joint pain, providing support that can reduce inflammation and help the body to repair cells. The synergistic effects of glucosamine, boswellia and MSM in Frame Essentials work wonders in relieving joint pain and providing nutrients to help soothe inflammation, relieve osteoarthritic pain and support joint health. By alkalinizing an acidic system, AIM BarleyLife® keeps disease-inducing inflammation at bay. The best action for preventing inflammation throughout the body is to take these nutrient-rich greens daily. The omega-3 and -6 essential fatty acids (EFAs) in AIMega® provide the good fats required to build and maintain healthy cells on a daily basis. Two of the numerous benefits of omega-3 are reducing inflammation and helping to lower the risk of chronic diseases, such as arthritis, cancer and heart disease. To get results, the body needs support on a daily basis. 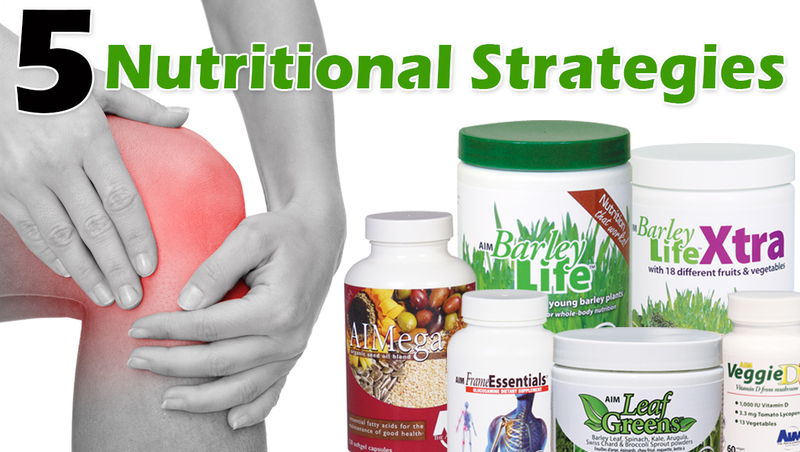 The positive impact of all three nutritional supplements working together can have a healing effect on a body ravaged by arthritis. AIM has never kept any of this a secret.